Right Lane? Left Lane? Shawn Lane. 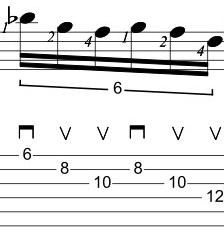 I read an interview once with Shawn Lane where he talked about how he did very little taping and that the majority of really fast playing that he was doing was one-note per string fingerings. 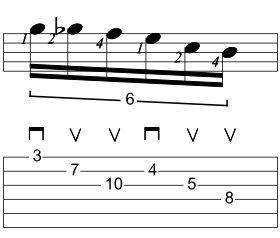 It’s a cool idea, and here’s how I’ve adapted it to a C Blues/C Pentatonic Minor scale. I’m using C minor as a key signature here – but the key signature doesn’t show up in all the following notation. 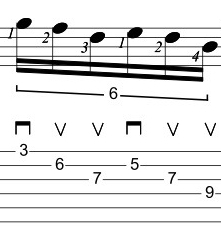 In every example below, all notated B’s and E’s are Bb and Eb respectively as seen in the tab. 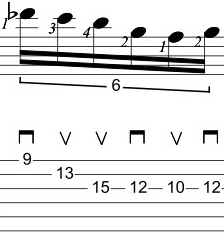 I’m going to use the descending portion of the lick starting from Bb. Now I’m going to move the Bb from the B string back to the high E string. 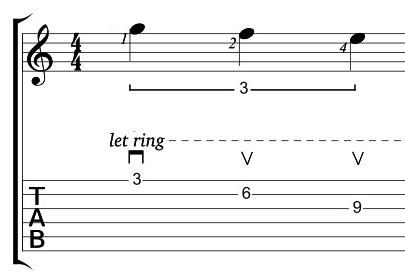 I’m using the 1st, 2nd and 4th fingers for the first three notes of the “After” section above. 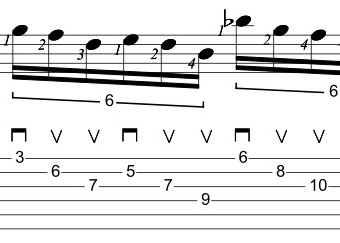 If you hold the notes down, you’ll loose definition on the individual notes because it’ll sound like you’re playing a chord. So make each note staccato by lifting the finger off each note after playing it. 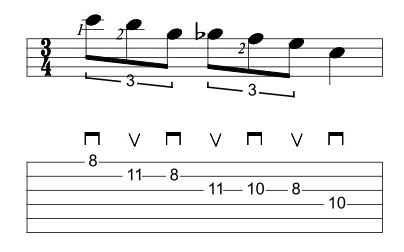 Try practicing just these 3 notes at first and work on getting the picking and the articulation down! 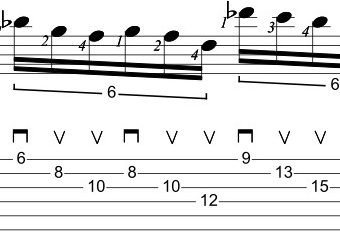 Fingerstyle players can play the 3-string groupings as m-i-p (middle, index thumb). 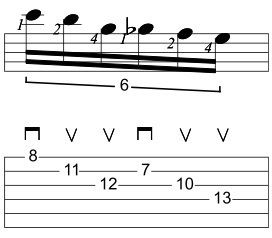 I’m playing the C on the D string with the 3rd finger so the pinky can grab the F#/Gb on the G string for the Paul Gilbert repeated note idea in the second sextuplet. 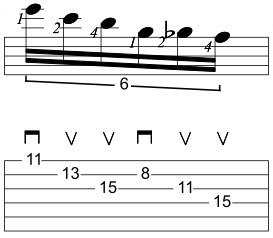 I’m starting from Bb on the D string and moving the Eb from the 8th fret of the G string to the 13th fret of the D string. I’ve also taken the C from the 8th fret of the High E string and moved it to the 13th fret of the B string for a symmetrical shape. 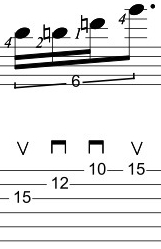 Finally I’ve added the D to get a nice “9th” sound on the sweep. (Check the video for a full explanation). Here’s something that isn’t covered in the video. 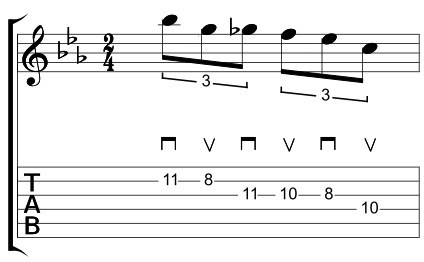 This lick starts on the b7, but you can adapt the idea to any scale degree. Moving down to the G, produces the following pattern. It’s not really useful on the top 3 strings but the D, G, B shape is feasible. Here it is from the b3rd. You can try it from the tritone as well. 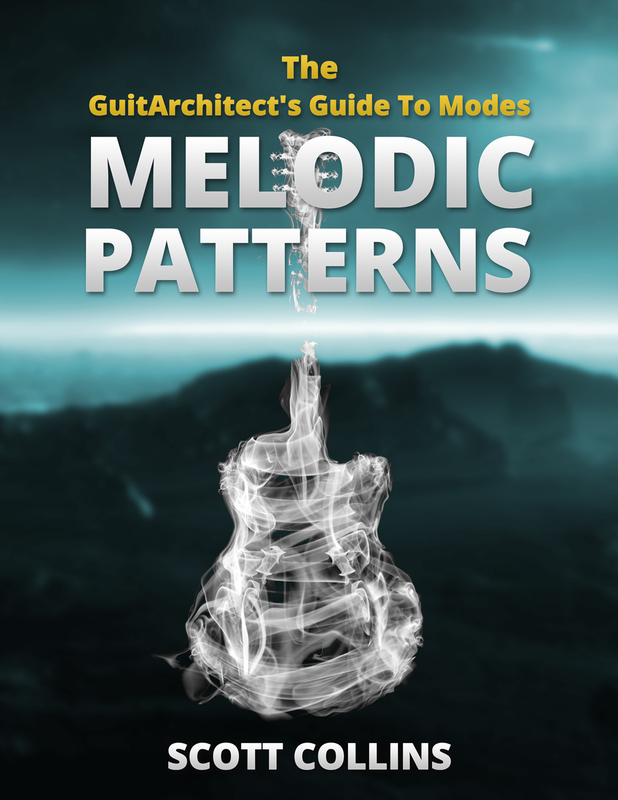 The key thing is to find a shape that works for you, find a chord you like the sound of it over and monkey around with it until you get something you like out of it.